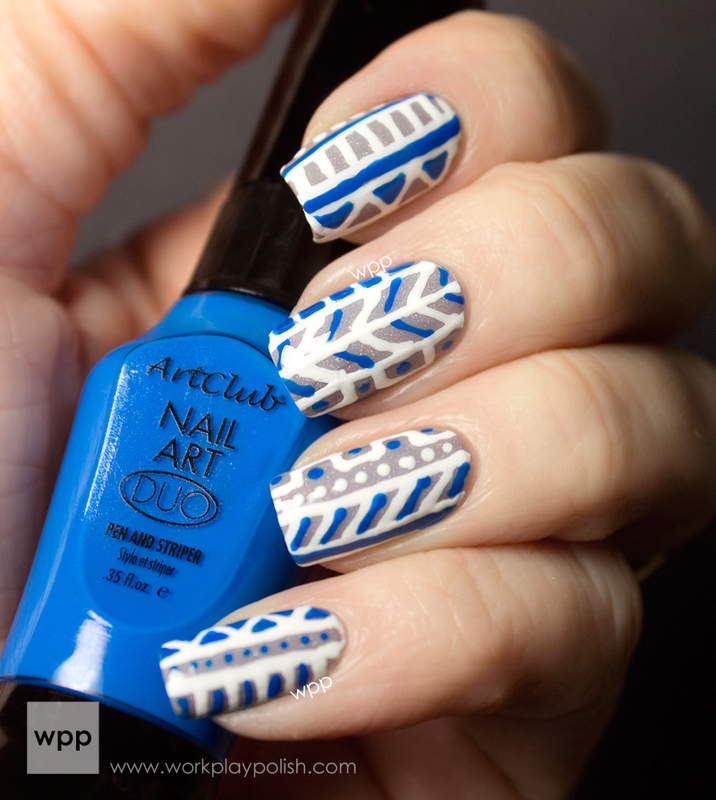 Nail art...finally! My first love. I do love swatching new polishes - but it's nice to sit down and do one look and actually wear it for longer than 15 minutes! Today I have my first semi-tribal design. I say "semi" because it just came out a little friendlier than I imagined. LOL. I used two coats of I Love Nail Polish (ILNP) Concrete Sprinkles as a base (I'll swatch some of the new ILNP holos in a separate post...prepare to love them!) 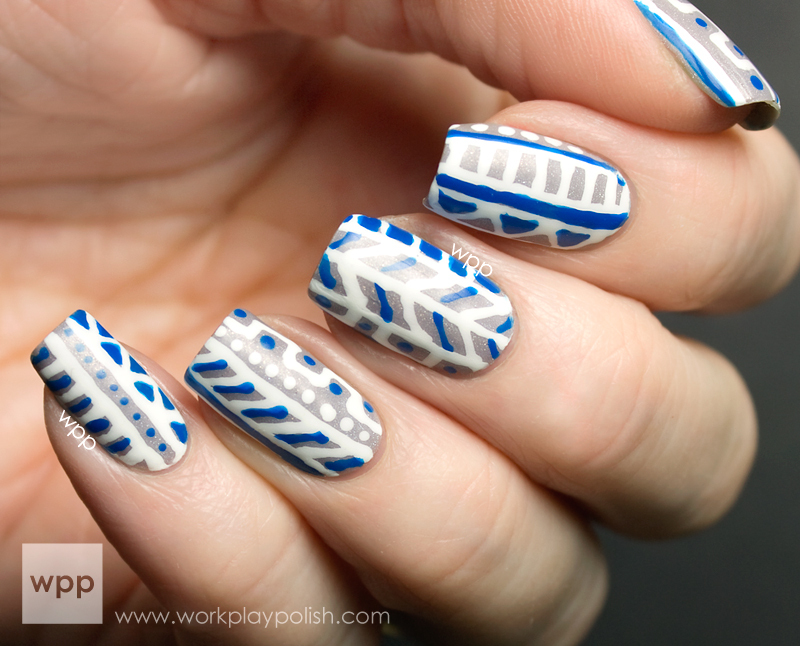 For the design I used Art Club Nail Art Duo Pens in White and Royal Blue. Art Club products are made by Color Club. The duo pens have a dual cap. You can either pop off the top to reveal a slim metal tip for precise lines and dots. Or unscrew the lid to use a striping brush. I really liked the metal tip. It's not perfect, as you can see. But I really did have a lot of control. I'm going to use these often...I can tell already. The first pic is after a dabbing coat of Seche Vite. I really used a light hand so the design wouldn't smear. In the next pic I added a coat of MASH Matte Polish. In person, I like the matte version a lot better. The Duo Pens retail for $4 and come in 21 colors! The last thing I need is to collect Duo Pens in addition to polish! I purchased mine at a license-only beauty supply store. I haven't seen them for sale in regular stores. Have any of you? But you can buy them online at the Color Club website. I should note that I also bought a black one, but the metal tip is completely bent and the brush is all jacked-up...so I'm exchanging it. The other two were fine so I'm hoping it was an anomaly. ILNP Concrete Sprinkles is a creamy light gray with SpectraFlair holo pigment. It's subtle and I love it. I've worn it to work almost everyday since I got it! Pics of Concrete Sprinkles and a few other ILNP holos coming soon! In the meantime, you can shop ILNP online.